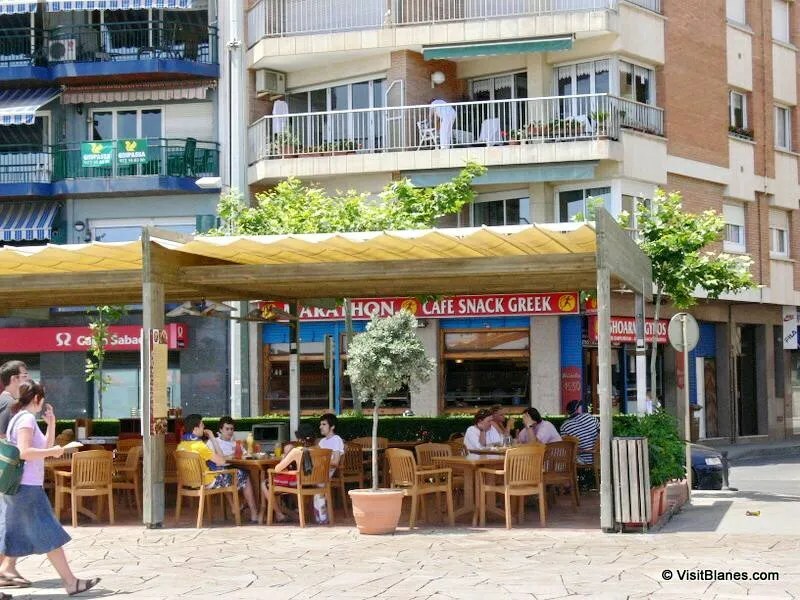 The promenade of Blanes — which runs from the Placa de Catalunya all the way up to the harbor — is lined with with restaurants, snackbars and other eateries. As is true in most such places, what you can expect is feast or famine — and everything in between. Highlighted on this page is Marathon, a Greek eatery that is squarely in the ‘feast’ category. The food here is, in one word, fantastic. Marathon’s shoarma dishes are, in our opinion, ones to judge all other shoarma meals by. Souvlakis, gyros, salads, you name it… they are excellent. French fries — chips to the British — are also very good. The generous meals come with a good side salad. Food like this says something about the people who prepare it. Their heart is in it — further evidenced by the efficient, friendly service. Small wonder then, that during the high season you’ll often find Marathon’s terrace packed with tourists and locals alike. The shaded terrace provides comfortable, sturdy chairs and roomy tables; not always a given elsewhere along the boulevard. Also unlike many of the other restaurants, Marathon does not use callers. They clearly don’t have to. You might think that all this goodness comes at a cost, but you’ll be pleasantly surprised by the reasonable prices. Marathon. Greek food in Blanes, highly recommended by the publishers of VisitBlanes.com. You’ll find Marathon on the promenade, at the corner of Passeig Cortils I Vieta and Calle Muralla. That is close to the Placa de Catalunya roundabout. Note: As publishers of VisitBlanes.com we make recommendations based entirely on our own opinions. We do not accept anything in return for our recommendations.